1 Since, then, you have been raised with Christ, set your hearts on things above, where Christ is seated at the right hand of God. This is a passage about what happens to a believer post baptistm. Why do I say that? Well, verse one says: you have been raised with Christ. The word in Greek for raised here is the same one Paul uses in Chapter 2, verse 12: “…having been buried with him in baptistm and raised with him through your faith in the power of God, who raised him from the dead.” This relationship of being raised out of the baptismal… and being spiritually raised with Jesus at His resurrection… is carried into Chapter 3, Verse 1. Hence, my favorite chapter in the Bible is all about what it means to live for Christ – after you’ve taken that step of obedience in your discipleship called baptism. 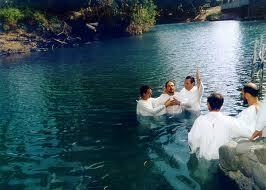 An article in Sports Spectrum years ago tells what a difference baptism plays in the life of a believer. I like the connection made in this article… between how excited he felt coming out of those baptismal waters and the desire to scope out Bible Study and prayer services where ever he was working. Becoming a believer in Christ, one undergoes not just an outward washing… but an inward heart transplant (Hebrews 8:10). Our hearts are no longer chasing after the fame, wealth and comforts that this world can give us… but are after the affections of a living Christ seated at the right hand of God. One final word about the word, raised. In the Greek it is in the Aorist tense indicating that our co-resurrection with Jesus is a past completed action. The moment we were raised with him… our hearts were his. I still remember the evening of my baptism. I wasn’t sure it was going to “take.” For years I had faced the invitation portion of the church service with dread. I felt an urge to do something, but wouldn’t do anything about it. I wondered if now, after I had taken the plunge (literally as well as figuratively) I would still have that same feeling. After my baptism, I changed my clothes and joined the congregation mid-sermon. When the time came for the invitation… all I felt was… peace. My heart was truly His!